Aim: To evaluate the cleaning efficacy of endoactivator, EndoVac (EV), and self-adjusting file (SAF) as irrigant adjunct in the removal of debris from isthmus. Materials and Methods: Forty extracted human mandibular molars were taken. Canals were prepared up to F4 protaper file. Irrigation after each file size was done by 1 ml normal saline. Final irrigation was done by 4 ml of 5% NaOCl and activated in each canal for 1 min with different activating systems. Teeth were divided randomly into 4 groups according to activation system as manual activation (control group, n = 10), Group 2 SAF system (n = 10), Group 3 endoactivator (n = 10), and Group 4 EV (n = 10). After activation final flush was done with 1 ml saline. The mesial root of each tooth was sectioned and checked for isthmus cleanliness by stereomicroscopic analysis. Images were analyzed by ImageJ software. Percentage of debris remaining in each group was calculated. Results: There is no statistically significant difference in cleaning efficacy of endoactivator, EV, and SAF systems. Conclusion: All three techniques remove debris from isthmus area more efficiently than manual dynamic activation. Introduction: The purpose of this in vitro study was to evaluate the concentration dependent effect of proton pump inhibitors on the action of calcium hydroxide against E. faecalis using a broth dilution study. Methods: Calcium hydroxide at a concentration of 16 mg/ml, pantoprazole and Lansoprazole at a concentration of 1 mg/ml made into dilutions of 6.25 and 25 μg/ml was incorporated into a broth containing E. faecalis and spectrophotometrically analysed at 630 nm at two time parameters of 12 hours and 24 hours. Results: At 12 hours there was statistically significant growth inhibition by group 5 (calcium hydroxide and lansoprazole 6.25 μg/ml). At 24 hours,the maximum Inhibition of E. faecalis was demonstrated by group 2 (calcium hydroxide and chlorhexidine 2%) and group 5 (calcium hydroxide and lansoprazole 6.25 μg/ml). Conclusion: Concentration dependent usage of proton pump inhibitors along with calcium hydroxide have potential in the eradication of persistent apical periodontitis. Introduction: This study was carried out to investigate the clinical and radiographical effectiveness of periapical surgery with Biodentine™ used as a root-end filling alone or in combination with demineralized freeze-dried bone allograft and plasma rich fibrin (PRF) in different cases. Materials and Methods: Twenty patients were selected according to selection criteria. After complete orthograde endodontic treatment, Biodentine was used as a retrograde filling material by the surgical method, with or without an adjuvant, i.e., PRF and/or demineralized freeze-dried bone. Postsurgical healing was assessed by radiographic evaluation at 1, 3, and 6 months. Results: The results were tabulated and analyzed. At 6 months postsurgical follow-up, 88% of the treated cases showed complete radiographic healing. Conclusion: Based on our findings, it could be concluded that Biodentine can be successfully used at a retrograde filling material with or without adjuvants. Aim: This in vivo study was done to correlate the values of three different electronic apex locators: Root ZX, iPex, and Apex ID, with the radiographic working length (WL). Materials and Methods: Nineteen maxillary incisors with completely formed root apices indicated for endodontic treatment were chosen. After access preparation, coronal flaring and pulp extirpation, electronic measurement of WL was done with a No: 15 K file using the three devices on each tooth. A WL radiograph was then taken with the file placed within the canal and the length determined by following Ingle's method. The data were then analyzed using the correlation coefficient and Z-test. Results: Root ZX showed the maximum correlation (r = 0.9881) with radiographic WL followed by Apex ID (R = 0.9731) and iPex (R = 0.9508). Root ZX had a statistically significant higher correlation with radiographic WL in comparison with iPex (P < 0.05). 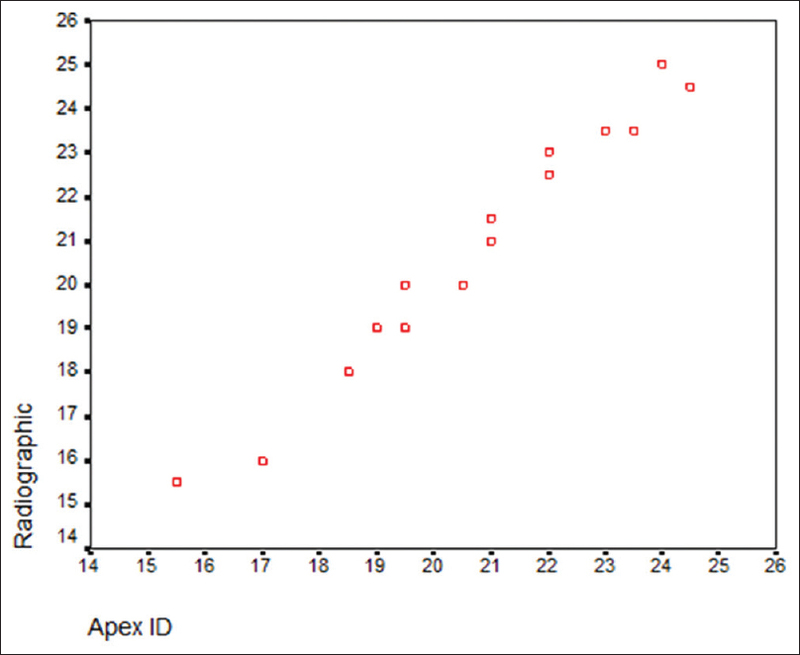 Conclusion: Maximum correlation of readings with the radiographic length was shown by Root ZX followed by Apex ID and then by iPex. Aim: To evaluate the effect on antimicrobial property of mineral trioxide aggregate (MTA) against Enterococcus faecalis when mixed with 2% chlorhexidine gluconate, calcium hydroxide, and tetracycline powder. Materials and Methods: Pellets of MTA, MTA with 2% chlorhexidine gluconate, MTA with calcium hydroxide, and MTA with tetracycline powder were prepared. The antimicrobial activity was tested on Sheep Blood Agar. Wells were made and the mixed material was placed in these wells. The diameter of zones of inhibition was measured after 24 h and 48 h incubation at 37°C. 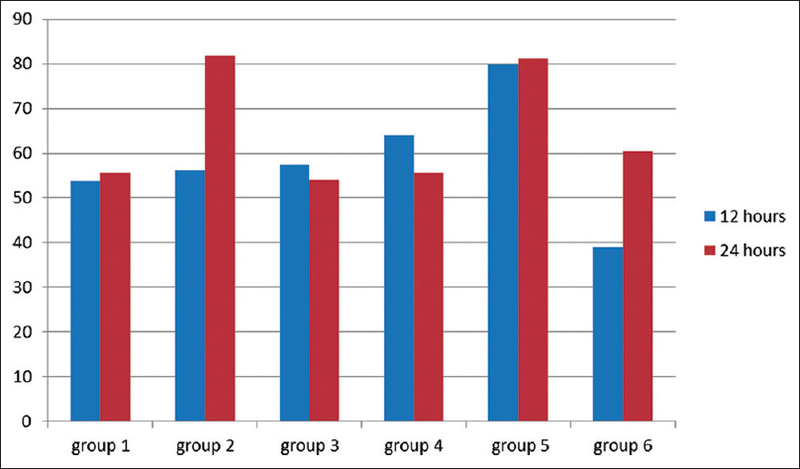 The data were analyzed to compare the antimicrobial efficacy of all the groups by ANOVA test. Results: The zones of inhibition were measured using precision ruler. This study showed that the best antimicrobial efficacy against E. faecalis was exhibited by the group in which MTA was mixed with 2% chlorhexidine gluconate followed by calcium hydroxide group and MTA group. The tetracycline group was least effective. 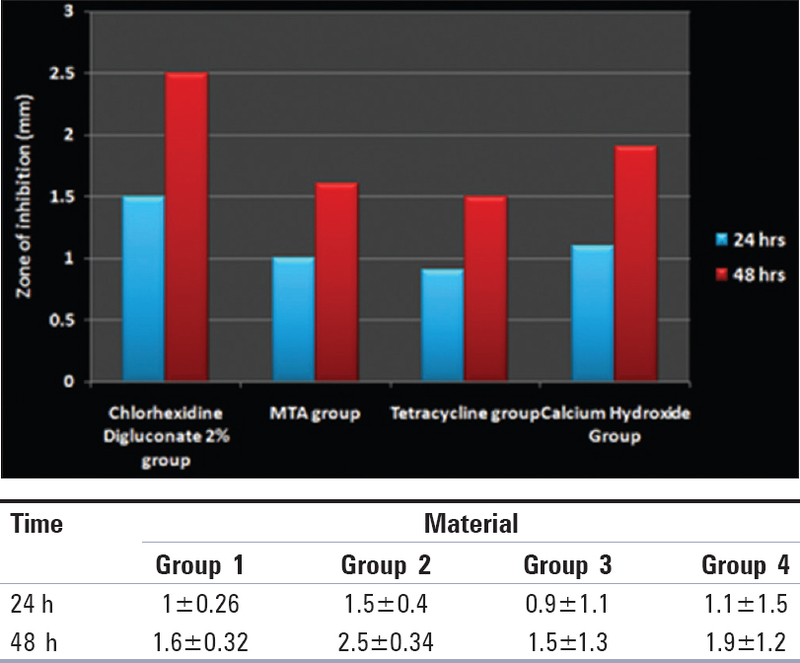 Conclusion: The study concludes that the addition of 2% chlorhexidine gluconate to MTA enhances the antimicrobial property and is more effective than MTA when used as a root end filling material alone. Clinical Significance: In cases where nonsurgical treatment of root canal fails and need of surgical intervention is a must to salvage the tooth, role of root end filling material becomes important. It should not only provide a good seal but also be antimicrobial in nature so that chances of re infection re least. Aims: To evaluate and compare the effectiveness of periapical surgery using mineral trioxide aggregate (MTA) as a retrograde filling material with/without using hydroxyapatite or platelet-rich fibrin (PRF) in curetted periapical defect and to evaluate the patients clinically and radiographically at each recall visit. Subjects and Methods: The study was conducted on thirty patients having periapical radiolucency in maxillary anterior teeth. The selected teeth were divided into three groups: Group A, Group B, and Group C having 10 teeth each. All the teeth were treated with single visit root canal treatment. The periapical curettage along with apicoectomy was followed thereafter. In all the groups, root end cavity was prepared. In Group A, root end cavity was filled with MTA. In Group B, root end cavity was filled with MTA followed by placement of hydroxyapatite in the curetted periapical defect. In Group C, root end cavity was filled with MTA followed by placement of PRF in the curetted periapical defect. In all the three groups, patient recall visits were scheduled after 1, 3, 6, and 9 months time interval for clinical and radiological examination. Results: A significantly higher rate of healing was observed after 9 months in Group C (82.36%) followed by Group B (65.16%) and Group A (60.12%). Conclusions: Placement of root end filling material contributes greatly to the success of surgical treatment. To enhance the healing of periapical defect, use of host modulating agents such as PRF is preferred over grafts as these are autologous and contain growth factors that promote faster healing of periapical defects. Aim: The aim of this study was to compare the push-out bond strengths of a resin-based sealer and a mineral trioxide aggregate (MTA)-based sealer after using normal saline and 2% chlorhexidine (CHX) as the final irrigant. Materials and Methods: Fifty percent of the samples were irrigated with 2% CHX, and other 50% samples were irrigated with normal saline as the final irrigant. Each set of twenty samples was then further split into groups based on the sealer used. 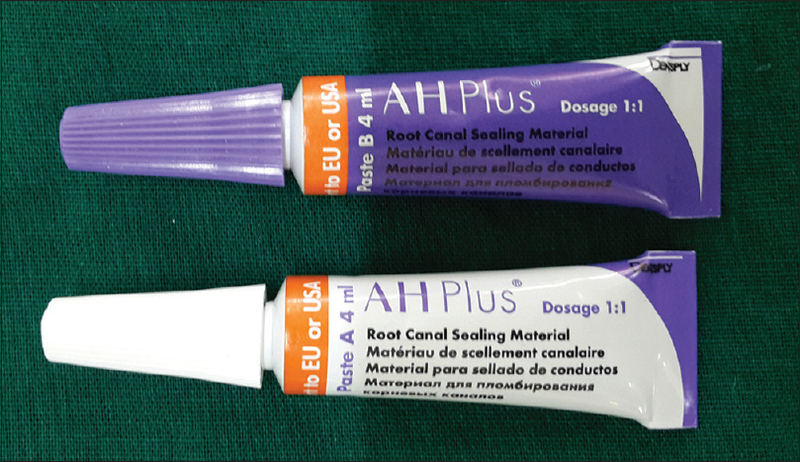 For Group 1 - AH Plus® (Dentsply, Maillefer, Ballaigues, Switzerland), a resin-based sealer was used after using normal saline as the final irrigant (n = 10). In Group 2 an MTA-based sealer was used after using normal saline as the final irrigant (n = 10). In Group 3, AH Plus® (Dentsply, Maillefer, Ballaigues, Switzerland) was used after using 2% CHX as the final irrigant (n = 10). In Group 4, an MTA-based sealer was used after using 2% CHX as the final irrigant (n = 10). After obturation, all the samples were cut perpendicular to their long axis to obtain slices of 3mm each from the coronal and middle third. The discs were then subjected to assess the push-out bond strength by using the Universal Testing Machine. Results: AH Plus® (Dentsply, Maillefer, Ballaigues, Switzerland) showed a significant higher push-out bond strength as compared to the MTA-based sealer after using both saline and 2% CHX. The highest Push-Out Bond Strength was seen with AH Plus® (Dentsply, Maillefer, Ballaigues, Switzerland) after using 2% CHX. Conclusion: AH Plus® (Dentsply, Maillefer, Ballaigues, Switzerland) after using CHX as the final irrigant has shown the best result among all the groups. 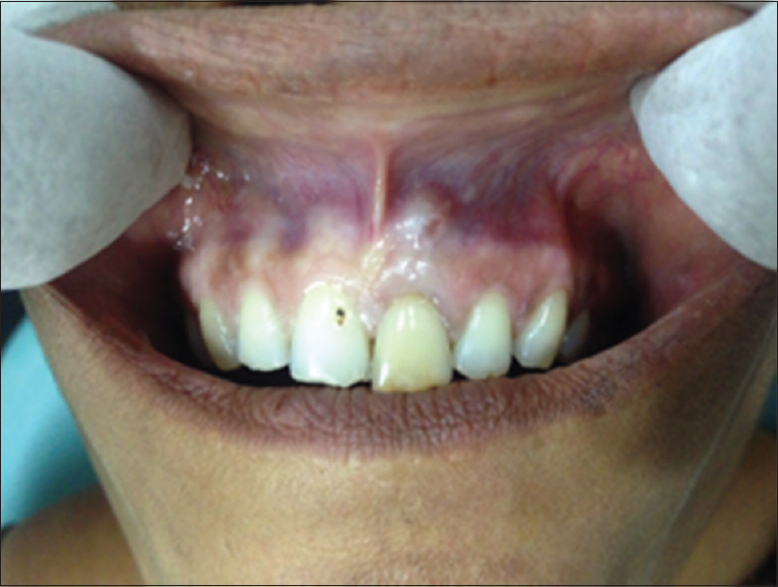 Aim: The objective of this study was to determine the pain produced from needle insertion at bilateral labial site prepared with topical application of 2% lidocaine gel, 20% benzocaine gel, and placebo paste at subsequent visits in a same patient. Materials and Methods: Forty healthy individuals aged 18-30 years old were subjected to three sessions in which they were treated with 2% lidocaine gel, 20% benzocaine gel, and placebo paste. in all sessions, a 26-gauge needle was inserted in maxillary labial mucosa before and 1 min after the drug application. Immediately, after needle insertion, participants indicated pain intensity on visual analog scale (VAS). Results and Conclusions: Pain responses were compared based on subjects' self-report using VAS. Results showed that lidocaine and benzocaine were equally effective, and both were better than placebo in reducing the pain of needle insertion. Aim: The aim of this in vitro study was to compare the push-out bond strength of Biodentine (Septodont, Saint Maur des Fosses, France) and mineral trioxide aggregate (MTA) (Angelus, Londrina, PR, Brazil) when treated with 3% sodium hypochlorite (NaOCl) and 2% chlorhexidine gluconate (CHX). 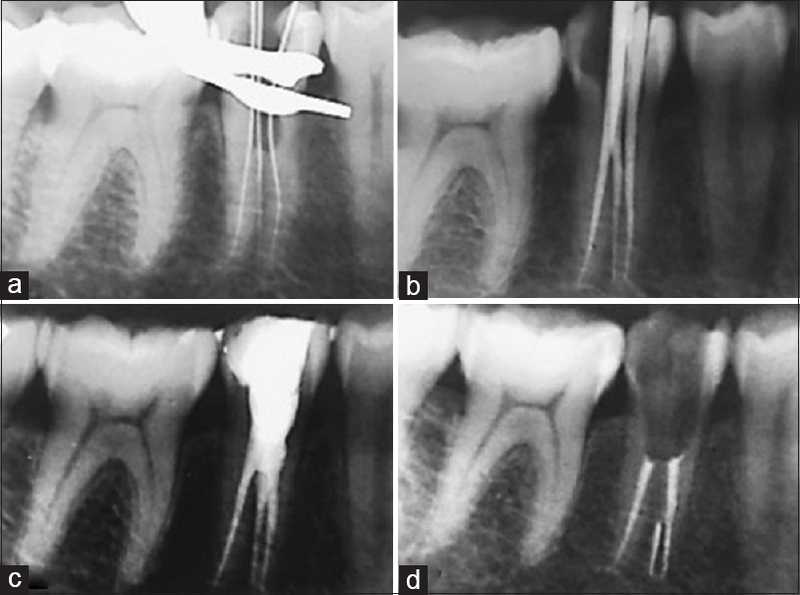 Materials and Methods: Forty-six single canal premolars were selected for this study, and the canal spaces were prepared with #5 Gates glidden drill (1.3 mm diameter). The dentin of these teeth was horizontally sectioned into 1-mm-thick slices at the mid-root level. The samples were divided into two groups (n = 20). Biodentine and MTA were placed into the canal space of dentin slices. The samples were wrapped in wet gauze for 10 min and divided into two subgroups (n = 10) to be immersed into 3% NaOCl and 2% CHX for 30 min. No irrigation was performed in the controls (n = 3). After incubation for 48 h, the dislodgement resistance of the samples was measured using a universal testing machine. The samples were examined under a stereomicroscope to determine the nature of the bond failures. Results: Biodentine showed significantly higher push-out bond strength than MTA (P < 0.05) in the presence of both NaOCl and CHX. Within the MTA group, CHX further reduced the push-out bond strength when compared with NaOCl. Conclusion: Push-out bond strength is the force needed for the displacement of the dental material tested. The various irrigants used during the root canal therapy may increase or decrease the push-out bond strength of a material. Dental trauma in immature teeth with necrotic pulp and apical foramen with large thin and fragile walls becomes a challenge to treat conventional endodontic treatment. The objective of this report is to demonstrate a clinical case in which the apexification through calcium hydroxide-based dressing, succeeded in forming a calcified apical barrier. 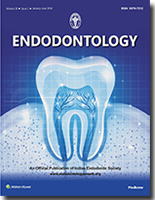 It concluded that a barrier with mineral trioxide aggregate superimposed with the endodontic obturation of gutta-percha advocated in the central incisor led to a successful endodontic procedure. Managing trauma to anterior teeth in children is a challenge for dentists. It can be further complicated by the presence of a foreign body in the root canal which acts as an additional nidus of infection. This foreign body is often diagnosed accidentally after radiographic evaluation. Thorough and careful clinical and radiographic assessments are required for complete retrieval of foreign body without much damage to the tooth structure. 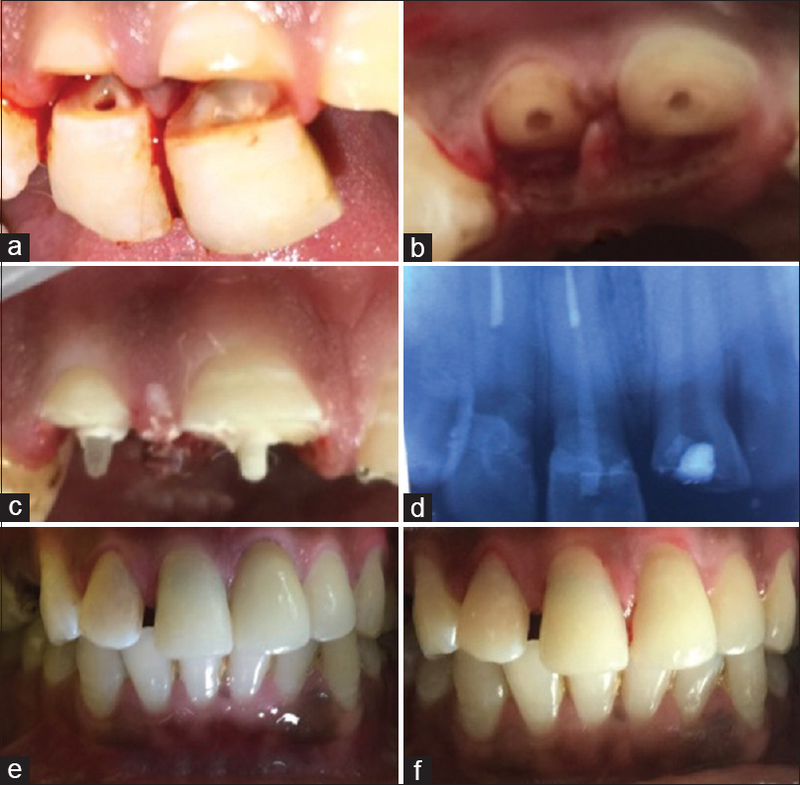 This paper presents a case series of two case reports where successful complete retrieval of foreign objects was performed from the root canals of permanent incisors followed by esthetic management of the involved teeth. 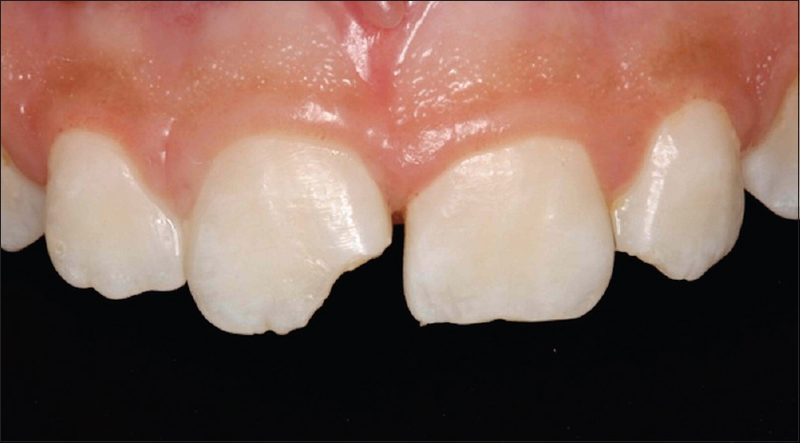 Morphological variations are frequently observed in the crown as well as in the roots of maxillary molars. One such diversity is the prescence of a supernumerary cusp termed as "paramolar tubercle." The clinician must have a thorough knowledge of the external as well as internal tooth morphology and novel diagnostic aids like cone-beam computed tomography aids in the successful management of these cases. This case report describes the successful diagnosis and treatment of a four-rooted maxillary second molar with paramolar tubercle and five root canals. The maxillary second molar tooth had two palatal roots with individual canals in addition to the extra canal of tubercle. This combination is very rare and first of its kind to be reported in the literature. Presence of second canal in mesiobuccal root of maxillary second molar is not uncommon but generally found closer to mesiobuccal orifice. 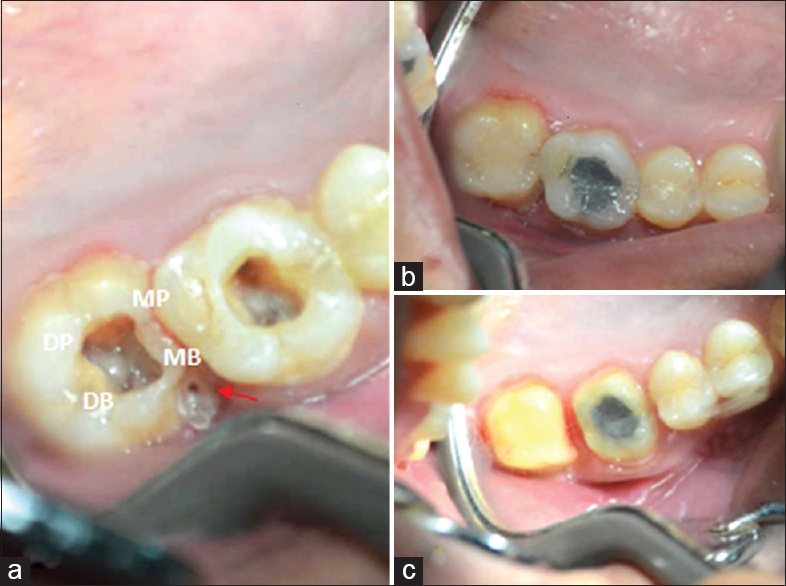 This article reports a case of a maxillary second molar with an orifice of second mesiobuccal canal closer to palatal canal orifice. Talon cusp is not an uncommon developmental anomaly. 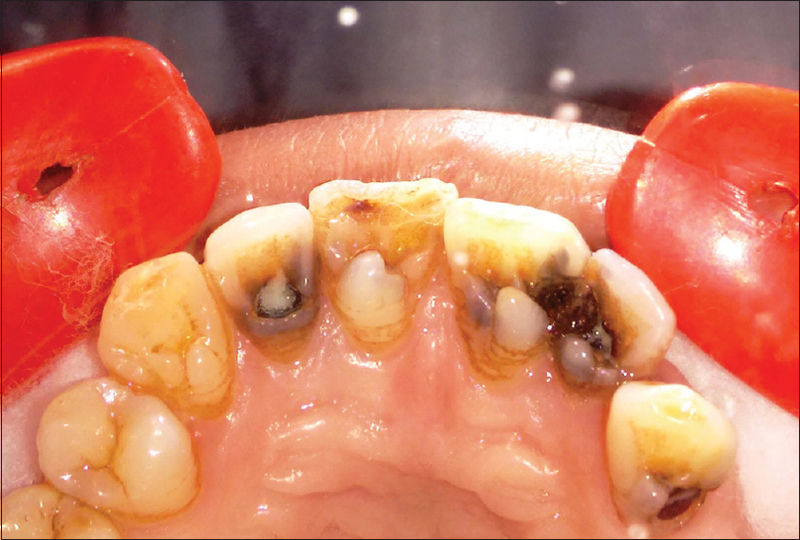 However, occurrence of multiple taloned teeth in the same patient is rare. This case report presents the management of four maxillary anterior teeth with talon cusps in the same patient. Hattab's classification was used for diagnosis of the type of talon in each tooth. Various treatment options may be employed for coronal fracture of anterior teeth and root, depending on the level of fracture. The following case reports highlight the anterior tooth trauma managed with reattachment of fractured segments using post and cores. In the first case, an easy and ultraconservative technique without any tooth preparation is used which involves intraradicular support, i.e., fiber post and core. 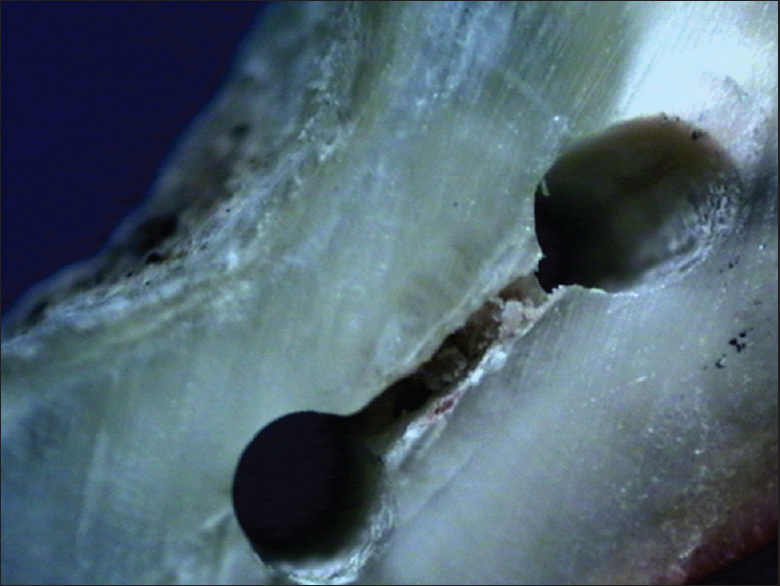 In the second case, an interdisciplinary approach is used to treat the root fracture where biological width was encroached. The flap was raised to expose the fractured root with a small amount of osteoplasty so that the segments could be checked for exact fit and bonding can be done with proper isolation of the operating field. 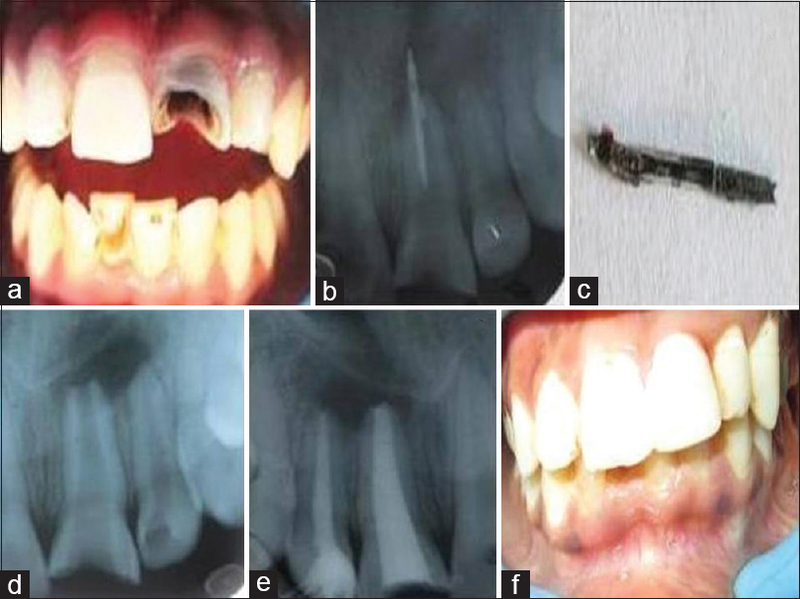 Successful esthetics and function were restored by conservative and economical means, and 6 months follow-up showed no failure of bonding or postoperative pain, indicating crown, and horizontal root fracture after trauma should not go for extraction. Thorough knowledge of root morphology and its associated root canal anatomy forms the prime basis for the success of any endodontic therapy. Although rare, variations in canal number and configuration could affect the treatment outcome. Managing these additional canals with abnormal morphology is a challenging task for every clinician. This case report presents the successful management of two maxillary first molars with aberrant root canal morphology. The first case has two palatal root canals with a total of five canals and the second case has two distobuccal canals. Mandibular second premolars are considered as an enigma to the endodontist because of their wide variations in root canal morphology. 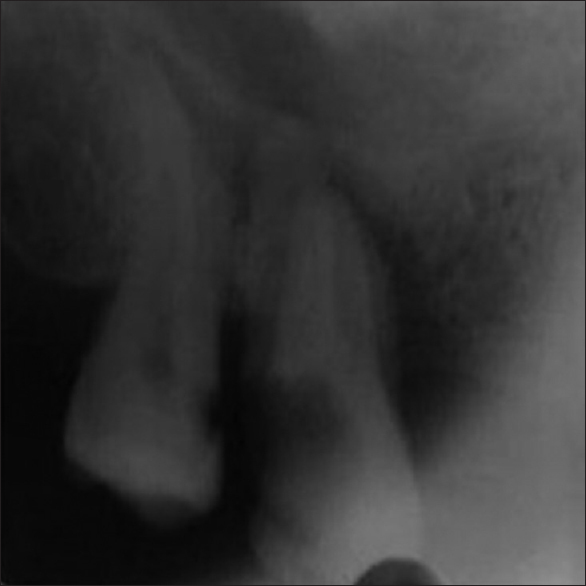 Mandibular premolars with three roots are rare and with taurodontism are even rarer. Failure to negotiate and properly treat these cases may result in the loss of the tooth. Knowledge of variations in root canal anatomy and accurate diagnosis with novel diagnostic aids like cone beam computed tomography (CBCT) assist in thorough debridement and three-dimensional obturation of the root canal system, thus increasing the success rate of nonsurgical endodontic treatment. 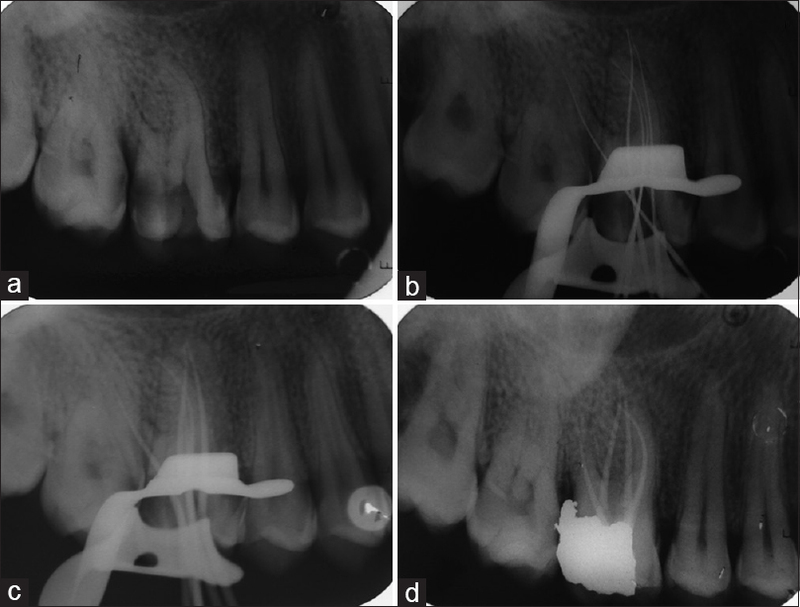 This article describes the successful management of the right mandibular second premolar with taurodontism and three separate roots diagnosed using CBCT.